The movies themselves are as enchanting as ever, though those who swear only by the extended editions will probably want to wait for those Blu-ray discs, likely coming in 2011. These theatrical cuts nevertheless are worth revisiting, with their more streamlined storytelling. What is lost in additional character bits and backstory is gained in more forward momentum. And, as appealing as they are, the extended editions are a bit much to do in a single sitting, whereas the theatrical cuts can be managed without getting bedsores. Jackson's fully-realized Middle Earth really springs off the screen, even for those who are intimately familiar with the movies in their various forms. Much of that is due to the design sense of Alan Lee and John Howe, two artists steeped in the world of Tolkien. Although occasionally Jackson lets himself get drawn away from the author's intent (the silly Brego the Wonder Horse episode on the way to Helm's Deep being the most offensive), on the whole he's faithful enough to the source material to keep it solidly grounded without being over-reverential, which would be equally deadly. 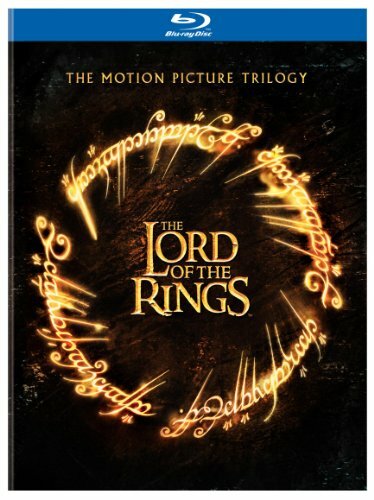 The characters have lively interaction and human foibles that aren't really part of Tolkien's fantasy world, yet they're useful in a cinematic production; I doubt that the trilogy would ever be as popular in a filmed version if say Aragorn were as stiff and unwielding as he is portrayed in the novel. But you're interested in the video quality, and sad to say it's rather lacking in this first Blu-ray effort. Right off the bat, we're greeted with massive edge enhancement on the New Line logo, which bodes ill (though to be fair, it was only seriously obtrusive on a few other occasions, most notably during Gandalf's conversation with Bilbo at Bag End; massive halos envelope Ian Holm's nose for some reason). The color timing is over-aggressive as well; after having seen Fellowship of the Ring four times in theaters, I'm quite certain that the Hobbiton sequences were not the blinding neon green that this disc presents. The gold of Rivendell is somewhat overdone as well, though not to the disturbing level that the greens of Hobbiton are. One of the major complaints about the original DVD releases was the over-filtered appearance of the NTSC discs (the PAL versions don't suffer from this nearly as much). Unfortunately, that heavy filtering is present here as well. While parts of the Rivendell sequences give nice attention to the detail and tracery, much of it is lacking in fine detail. Particularly distressing are the scenery shots, such as the Fellowship boating down the Anduin River, which are a smeary mess, possibly of DNR. On the whole, closeups look decent (the confrontation of Elrond and Arwen in Return of the King looks superb), but medium and long shots are lacking in pop and realism. The New Zealand mountain shots are hit and miss, with some looking beautiful and others barely above DVD quality. The thrilling sequence of the lighting of the beacons, alas, looks so overprocessed that it loses much of its impact; once again, the color timing has gone awry, turning the orange flames a bright red. Surprisingly, the black levels are somewhat lacking. These never quite reach a deep, dark black, but only a version of grey. What the BD version does do well are the darker sequences; the sequences at the Prancing Pony, in the Mines of Moria and during the Battle of Helm's Deep benefit from the deeper shadow detail available in HD. As problematic as the video is, the audio, DTS-HD Master Audio 5.1, sounds spectacular. That's particularly true of the dialogue and effects; as Cate Blanchett narrates the opening it feels as if she's in the room with you. The mixing on Howard Shore's classic Wagnerian score is a bit subtler, but it's at all times quite effective and the lossless audio provides an expansive soundstage. The big moments (Sauron's first destruction, the emergence of Mordor's army from Minas Morgul, the Battle of the Pelennor Fields) have a huge impact that matches what was experienced in the theaters. Other than a welcome set of trailers, none of the extras are in HD. The bonus materials, on three DVDs, essentially track the special features on the theatrical DVDs. These tend to be almost wholly promotional pieces, with a variety of television specials, including the Quest for the Ring FOX TV special, A Passage to Middle Earth Sci-fi Channel special, and the National Geographic special devoted to Return of the King (but unaccountably the one for Fellowship of the Ring is excluded). Sean Astin's short film The Long and the Short of It is here, as are a variety of TV spots, two music videos, and 29 featurettes of several minutes each from lordoftherings.net (annoyingly, there is no "Play All" button for them, and the menus are maddeningly slow in their animations). In the useless category, there are links to BD-Live, which remains unready for prime time; despite several attempts, "network problems" prevented any connection to see what might be lurking there. A second keepcase holds three discs with digital copies, for those who need epic movies in miniature form. As usual, these self-destruct after a year from issue, so act quickly if you want them. The packaging really isn't up the the task of holding nine discs; my cases suffered from several broken hinges. While it's nice to have these films in upgraded versions, there's still much work to be done before this material is presentable enough for the demanding audience that will want to experience them in their full extended glory. The filtering and digital noise reduction simply have to stop. This set makes a decent stopgap in the meanwhile but there are enough shortcomings that I can't recommend it outright, as much as I would like to.